All our handmade leather products each are individually made and no 2 are the same, all the tooling and design is done by hand therefore each one is unique. If you like a product and would like it in a different color please contact us. This Handbag can be made in other colors and with other designs please contact us. Handmade Leather Credit Card Holder, Celtic Motif in Black Leather. Handmade Leather Credit Card Holder, Celtic Motif in Black Leather.This handmade Real Leather Cred.. Handmade Leather Credit Card Holder, Celtic Motif in Light Brown Leather. Handmade Leather Credit Card Holder, Celtic Motif in Light Brown Leather.This handmade Real Leathe.. Handmade Leather Credit Card Holder, Celtic Motif in Medium Brown Leather. Handmade Leather Credit Card Holder, Celtic Motif in Medium Brown Leather.This handmade Real Leath.. Handmade Leather Credit Card Holder, Oak Leaf Motif in Medium Brown Leather. Handmade Leather Credit Card Holder, Oak Leaf Motif in Medium Brown Leather.This handmade Real Leath.. Handmade Leather Credit Card Holder, Rose Motif in Tan Leather. Handmade Leather Credit Card Holder, Rose Motif in Tan Leather.This handmade Real Leather Credit Car.. Handmade Leather Credit Card Holder,Oak Leaf Motif in Black Leather. Handmade Leather Credit Card Holder,Oak Leaf Motif in Black Leather.This handmade Real Leather Cre.. Handmade Leather Francesca Handbag in Medium Blue Traditional Design. Handmade Leather Francesc.. 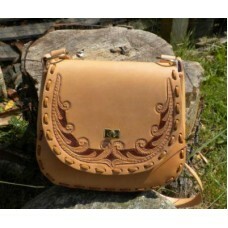 Handmade Leather Pioneer Style Handbag with Traditional Design. Handmade Leather Pioneer Style Handbag with Traditional Design. Handmade Leather Pioneer S.. Handmade Leather Sophia Handbag in Medium Brown. Handmade Leather Sophia Handbag in Medium Brown.Handmade Leather Sophia Handbag in Medium Brown, a T.. 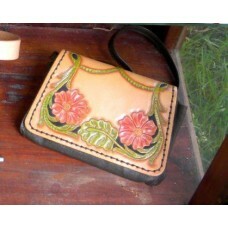 Handmade Small Leather Handbag with Flower Design and Zip Pocket. Handmade Small Leather Handbag with Flower Design and Zip Pocket. Handmade Small Leather Handba.. 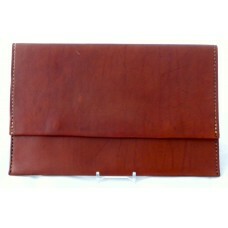 Handmade VGP Leather Clutch Purse Medium Brown . Handmade VGP Leather Clutch Purse Natural.Handmade VGP Medium Brown Leather Clutch Purse made w.. 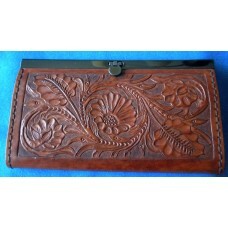 Handmade Leather Clutch Purse with Hand carved Floral Design. Handmade Leather Clutch Purse with Hand carved Floral Design.Handmade Leather Purse w..